Greenhouses are wonderful things, in that they enable us to grow and nurture our most prized plants. Or they can help us cultivate vegetables. But they are also quite difficult to purchase,because there are so many different kinds and specifications. We’ve taken that difficulty away, by bringing you a selection of greenhouses that are designed to be easy to use and maintain. Grab yourself one of these and you’ll soon be wondering what you (and your plants) did without it. 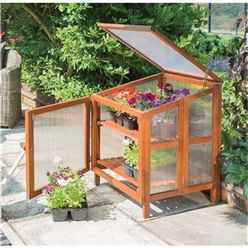 We start off with a wonderful Nison cold frame that allows you to give special care to the youngest of plants.One of the best aspects of this cold frame is the ability to take advantage of the hinged lid. This allows you to bring in some much needed ventilation as and when you require it. It’s easy to use, and it makes a big difference, especially to smaller plants, who can need ventilation a little more urgently than more established plants. You also have a cold frame that has polycarbonate glazing. 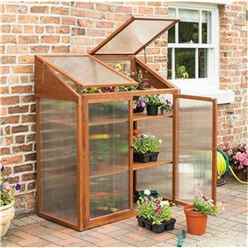 This is a very tough glazing, and it also helps by defending the interior of the cold frame against UV rays. This aluminium cold frame is attractively priced, and compact enough to place anywhere in the garden. 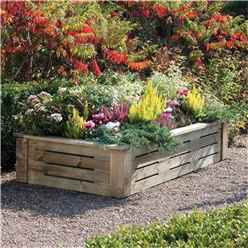 If you want to step things up a little bit you could always go for a raised planter. 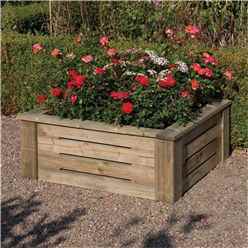 We have an excellent version in the 3 x 3 raised planter by Carlton. Use this to ensure that your plants get enough depth to grow in, and also present an attractive display to anyone who visits your garden. It's lovely to look at and includes features such as pressure treatment, which protects the plants against rot. 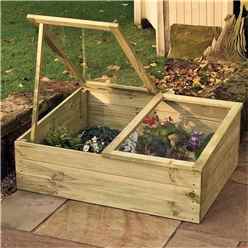 It has also been created using heavy duty timber, so you have an item that can withstand the hard work that bad weather and changes in season brings. Its a lovely planter, and the perfect place to grow and cultivate your prized plants. Our Warwick greenhouses are respected, mainly because they are easy to put together and provide excellent spaces to grow plants. 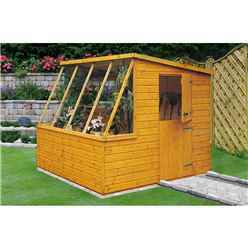 One of the most popular models is the 4 x 6 greenhouse, which comes with a free base. The base of this greenhouse has been galvanised, and this means that you have a unit that is naturally resistant to rust and erosion. This treatment can save your greenhouse, and prolong it’s life even in the worst weather. Other features include polycarbonate glazing, which is unbreakable, and also provides strong protection against harmful UV rays. In other words, it’s tough and protective. 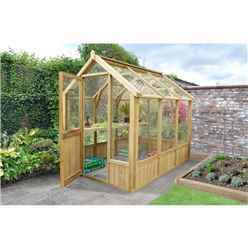 The 14 x 8 Warwick greenhouse is also a popular seller. The unit has very high eaves, so you have much more head height than you would in other buildings. In addition, you have 4 opening windows in the greenhouse, which means that you can easily bring in ventilation when you need to. This gives you a lot more practicality and flexibility in your plant care. This unit also has strong polycarbonate glazing, as well as an integrated gutter system, so you have absolute peace of mind. Your plants will be kept safe and dry all year round. 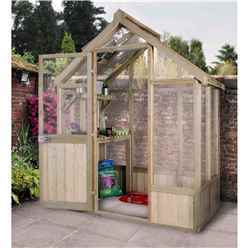 The 6 x 4 wooden pressure treated greenhouse by Warwick is particularly useful. The pressure treated timber means that you have a building that will last for years, and is 100% resistant to damp and rtot. That pressure treatment happens at the factory, and gives you plenty of peace of mind. There are also two opening top windows so you have opportunities to bring in extra ventilation when you need to. 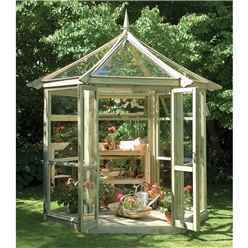 It’s a very versatile greenhouse, and the timber construction gives you a lovely rustic feel for your garden. So that’s good looks, and a very protective environment for your plants. Our top end product is the Felicity 9 x 8 summer glass house. One of the most attractive buildings we have ever had in stock, it looks beautiful, and helps transform your garden into a wonderful space. The distinctive building comes with three opening top windows and it has been fully planed for a completely smooth finish to the timber. One of the best features is the fact that there is an integral wooden floor. With toughened safety glass throughout, it’s a strong and attractive addition to any garden. Greenhouses are an essential if you have a plant collection that needs careful nurturing. For the serious grower, we have exactly what you need. For the causal potter, there is something here for you as well.